As I’ve stated countless times marketing is a process of getting people with a need to know, like and trust you. 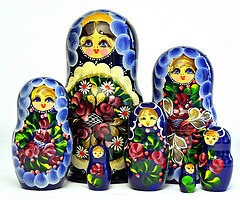 It’s a bit like the traditional Russian Matryoshka nested dolls – you open up one and that leads you the next step and the next step and the next. The key is creating a series of logical steps so that people take small steps along the path rather than asking them to make giant leaps. I’ve used a metaphor I call The Marketing Hourglass to lay out the step in the path – know, like, trust, try, buy, repeat and refer. These seven steps when outlined for small business owners, seem to bring the entire concept of a marketing system into much greater focus. Today I would like to outline what these steps might actually look like from a tactical standpoint for a typical B2B service business. This is the act of creating awareness so while it sometimes starts with a referral received, it’s often the act of putting something out there that gets the attention of your prospect. Know tactics – AdWords ad promoting free eBook that is related to your service offering but doesn’t sell anything directly, blog posts answering common client challenges amplified in social media, Facebook promoted posts for free eBook, LinkedIn Answers geared towards blog posts and free eBook content. In this step you must move towards gaining permission to continue a conversation. The key here is your email capture activities. Like tactics – Create landing pages for specific networks, create eBook landing page with autoresponder that delivers even more information related to eBook or other eBooks, offer weekly newsletter to all who download eBook. Trust is perhaps the most important step and yet it’s not one you can simply manufacture through one or two tactics – it’s comes together through a collection of things. Trust tactics – consistently deliver your newsletter, educate – don’t promote, get backlinks from reputable websites, participate on Facebook, LinkedIn, Google+ and Twitter by sharing great information and helping others find what they want, consistently write educational blog content, stimulate reviews on sites like Google+, LinkedIn and Yelp, submit press releases to online distribution sites such as PRWeb and find industry or local publications that accept contributed content. The try step is omitted by many in the desire to leap rather than lead. Try tactics – create and deliver an online or in person seminar related to your eBook, create a free or low cost experience of your knowledge or expertise through an audit or evaluation, create an unheard of guarantee, create a try before your buy option, create a low cost version, write a book. Obviously, this is the step we all want, but for me it’s just another stepping stone to the ultimate goal – a thoroughly thrilled customer. Buy tactics – give more than promised, add a bonus, create a new customer kit, look for ways to get increase education for more than the buyer, make it easy to for buyer to sell the solution internally. For most businesses, long-term momentum only occurs when the customers acquired in year one buy more as new customers are acquired in year two. This step must be intentional and designed in the beginning as opposed to left to accidental whim. Repeat tactics – create a results review process with every client, start an autorespoder series that provides education on additional solutions, write hand written notes for no reason, check in on LinkedIn with clients occasionally just to say hi, systematically send press clippings, create custom RSS feeds, create a client only newsletter, create mastermind and peer-2-peer client only groups. 100% referral from your client base is the goal of this system and while it won’t ever happen, if you begin with this result in mind, it’s more likely that a higher percentage of clients will refer. Refer tactics – create a partner team and introduce them to your clients, sponsor a not for profit event and include your clients, create eBooks or gift certificates that your clients and cobrand and distribute, feature your client stories in your marketing materials, hold client appreciation events, create a hot 100 prospect list and share it with clients for introductions. Obviously there are many things that come before the tactical implementation of your path, such as defining your ideal client you want to walk the path and communicating why your path is the perfect one to walk, but having an integrated set of tactics each with the goal of moving prospects and clients to the next stop along the way just makes marketing much easier.